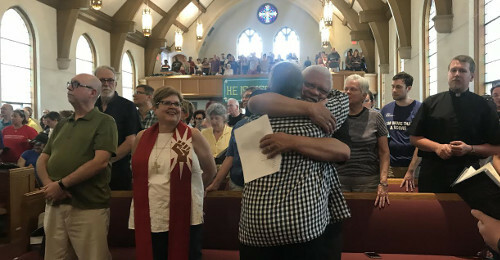 Over 500 people packed the First United Methodist Church of Ferndale and the lawn in front overlooking Woodward Ave. Sunday evening to share a message of love and justice following violence in Charlottesville, VA connected to a rally by white supremacists over the re-naming of Lee Park to Emancipation Park. Thirty-two-year-old Heather Heyer of Charlottesville lost her life when she and other counter-protestors were run down by a man who drove into the crowd. Nineteen others were injured in the crash, and countless others were injured in fights with those who were protesting the removal of Confederate icons through the South. Rallies in support of equality have been held across the county, including Detroit, Ann Arbor, Grand Rapids and Kalamazoo. Inside the Ferndale church, the microphone was passed to people sitting in the pews. Among the messages of solidarity were thoughts of how to do more than just hold signs and opine on social media. “We need to look at how our actions are racist,” said one attendee. “Not just stand up and say a Nazi in the south is wrong, but what can we do to be less racist?” He encouraged those in the room to be advocates for funding education in places like Detroit. Robert Cooper of the Association for Youth Improvement invited folks to get involved with the Bridging 8 Mile program which seeks to connect the city and the suburbs. “There’s an opportunity to bring closure, to bring healing,” he said. Discussion took place about how to have the hard conversations about race. “Listen when people tell us they are being hurt or marginalized,” said one attendee. The crowd also heard from local clergy, and among the crowd were people demonstrating affinity for faiths including Christians, Buddhists, Muslims, and Jews. They all joined together to sing “Lift Every Voice and Sing” before gathering in front of the church to demonstrate on Woodward Avenue where they were met by constant string of supportive horn-honks.